CCC Team's Patrick Bevin will be at the start line of the last stage at the Santos Tour Down Under. The rider suffered a heavy crash on the fifth stage of the race. The current leader of the race crashed in the last ten kilometres in a peloton that was already shaken up by the strong winds and the expectation for the finale. Despite the pain, Bevin went back to the saddle and in a nice gesture, the peloton slowed down until he was able to return with the help of his teammates. The New Zealander crossed the line with the peloton and could maintain his GC lead. Right after, he was taken to the hospital where after X-Ray and CT scans it was confirmed that there were no fractures, but multiple contusions and bruised ribs and hip. "It was such a nervous stage and there was a battle for position all day," said the rider after his visit to the hospital. "All it took was a touch of wheels and I went down. I'm pretty banged up right now but I really hope that I will be able to line up tomorrow. Fortunately, nothing is broken so we will see how I pull up in the morning." After further tests in the morning, Bevin has been cleared to take part in the last stage of the Australian race. 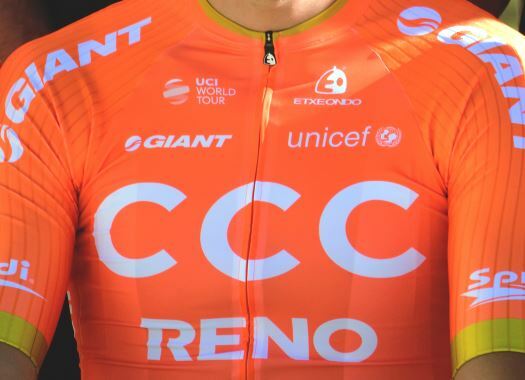 "Race leader Patrick Bevin has been given the go-ahead to race Tour Down Under stage six by CCCProTeam's medical team," explained the team in a tweet. "It's not going to be an easy day in the saddle but Paddy is as tough as they come. Get ready to cheer him on for one last day!"